Granulomatosis with polyangiitis (GPA) is associated with increased 18F-fluorodeoxyglucose (FDG) uptake on positron emission tomography/computed tomography (PET/CT). In comparison to CT, PET/CT has the advantages of whole-body imaging and detecting metabolic abnormality before structural changes. 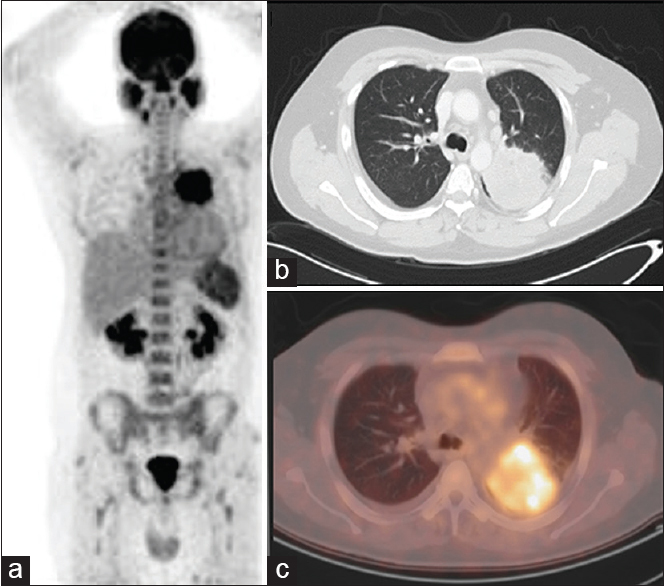 The role of 18F-FDG PET/CT to detect lesions in GPA has been published in several previous case reports., However, to our knowledge, this is the second reported 18F-FDG PET/CT case showing widespread GPA. The first case was reported by Almuhaideb et al. in 2011. In their case report, FDG PET/CT successfully detects occult areas of disease activity with no radiological or clinical evidence of involvement. A 41-year-old male presented with fever, shortness of breath, bilateral parotid swelling, and cough started 10 days earlier treated with azithromycin with partial response. There are bilateral parotid gland swelling and tenderness, but there were no enlarged cervical or supraclavicular lymph nodes (LNs). Routine laboratory analysis showed increased erythrocyte sedimentation rate (46 mm/h), elevated C-reactive protein (189 mg/L), and positive antinuclear antibodies. Infectious serology was negative. Chest X-rays revealed airspace shadowing in left upper zone, with infiltrative markings and obscured left cardiophernic (CP) angle [Figure 1]. CT showed left apicoposterior lung mass with collapse consolidation [Figure 2]b, pericardial and small left pleural effusions, left lower lobe nodule (LLL) with mildly enlarged meditational LN, bilateral renal masses [Figure 3]h, and left adrenal adenoma. On head-and-neck CT, there was bilateral markedly enlarged parotids [Figure 3]b and [Figure 3]d, enlarged right submandibular and bilateral lacrimal glands, multiple bilateral enlarged cervical LN, and extensive paranasal sinus disease. PET/CT [Figure 2] and [Figure 3] done 60 min after intravenous injection of 357.8 MBq of 18F-FDG demonstrated enlarged FDG-avid parotid and right submandibular glands [Figure 3]c with maximum standardized uptake value (SUVmax) of 7.6 in the left parotid, multiple bilateral small cervical LN with variable FDG uptake with highest SUVmax= 3.5, high nasal FDG uptake [Figure 3]a, bilateral FDG-avid maxillary sinus mucosal thickness more on the left side, left apicoposterior heterogeneous lung opacity with high FDG uptake (SUVmax = 7.7) [Figure 2]c, multiple enlarged hypermetabolic mediastinal LN with highest SUVmax= 3, LLL hypermetabolic nodule (SUVmax= 3.6), heterogeneously high splenic metabolic uptake [Figure 2]a (SUVmax = 4.9) with no focal splenic lesions, multiple bilateral renal hypodense hypermetabolic lesions, mild FDG avid pericardial effusion with SUVmax of 1.7 [Figure 3]e and [Figure 3]f, the largest seen in the right kidney (SUVmax= 8.7) [Figure 3]g and [Figure 3]h, intense diffuse prostatic hypermetabolism (SUVmax= 12.8) [Figure 3]i and [Figure 3]j, hypermetabolic heterogeneous bone marrow (BM), and small left adrenal lesion with low-FDG uptake (SUVmax = 1.2) and mean HU = −15, suggestive of adrenal adenoma. Biopsy of left upper lobe lung mass showed granulomatous noncaseating inflammation with small foci of necrosis with no evidence of malignancy. BM biopsy revealed reactive BM. Suggested differential diagnoses were infection, sarcoidosis, vasculitis, and others. Additional analysis done demonstrated a positive antineutrophil cytoplasmic antibody (ANCA) titer with elevated c-ANCA and anti-PR3 titers (119 units) while negative myeloperoxidase antibodies. Based on the above clinical, laboratory, radiological, and histopathological findings, diagnosis of GPA was proposed. Five months after prednisolone and rituximab treatment, there was a significant improvement in clinical, laboratory (c-ANCA titer 48 units), and radiological findings [Figure 4]. It is proven that FDG PET/CT is able to accurately detect active sites of GPA, including patients in whom other diagnostic markers have been inconclusive. Multiorgan involvement is often seen on PET/CT in patients with relapsing disease. Overall, functional PET imaging is a sensitive tool to establish disease distribution and guide diagnostic biopsies in GPA. The classic triad of organ involvement consists of lungs in 95% of cases, upper respiratory tract/sinuses in 75%–90%, and kidneys in 80%. Widespread: Additional organ involvement (skin [50%], eyes [45%,] peripheral nervous system (35%), and occasionally other organs as the heart and gastrointestinal tract). In our case, CT showed evidence of classical GPA with involvement of lungs, upper respiratory tract/sinuses, and kidneys. On FDG PET/CT, however, there is prostatic, splenic, and BM in addition to classical triad, upgrading the case from classical to widespread GPA. The role of 18F-FDG PET/CT to detect lesions in GPA has been published in several previous case reports., However, to our knowledge, this is the second reported 18F-FDG PET/CT case showing widespread GPA. The first case reported by Almuhaideb et al. showed FDG-avid right maxillary sinus/nasal cavity, right parotid, mediastinum, lungs, and prostate lesions, compared to our case which showed FDG-avid involvement in lungs, upper respiratory tract/sinuses, kidneys, prostate, spleen, BM, and possibly pericardium. Although the brain and kidney lesions are not easy to be detected on FDG PET/CT, it is reported that renal cortical involvement can be depicted  as in our case. In the current case, prostatic involvement was detected only on FDG PET/CT without concurrent CT or clinical evidence. Stillwell et al. reported that symptomatic granulomatous prostatitis is not common in GPA and only reported in 2% of cases. The incidence of antemortem splenic involvement in GPA is very low. This is mostly due to asymptomatic nature in majority of the cases. As in the current case, the spleen showed abnormally diffuse hypermetabolism with no corresponding CT changes and no related symptoms. We detected diffuse BM FDG uptake in axial skeleton, concordant with Nelson et al., who found diffuse BM and spleen uptake in 1/8 cases with GPA alone and 1/4 cases with concurrent malignancy. In terms of GPA extent, our case can be classified as widespread GPA, based on FDG PET/CT findings, showing additional occult areas of disease activity in spleen and prostate with no related or corresponding radiological or clinical evidence. Thus, this case report highlights the utility of 18F-FDG PET/CT for the assessment of disease extent in GPA and upgrading the disease from classic triad based on clinical and CT findings to rare form of widespread disease by detecting metabolically active occult areas of disease activity. Eustaquio ME, Chan KH, Deterding RR, Hollister RJ. Multilevel airway involvement in children with Wegener's granulomatosis: Clinical course and the utility of a multidisciplinary approach. Arch Otolaryngol Head Neck Surg 2011;137:480-5. Soussan M, Abisror N, Abad S, Nunes H, Terrier B, Pop G, et al. FDG-PET/CT in patients with ANCA-associated vasculitis: Case-series and literature review. Autoimmun Rev 2014;13:125-31. 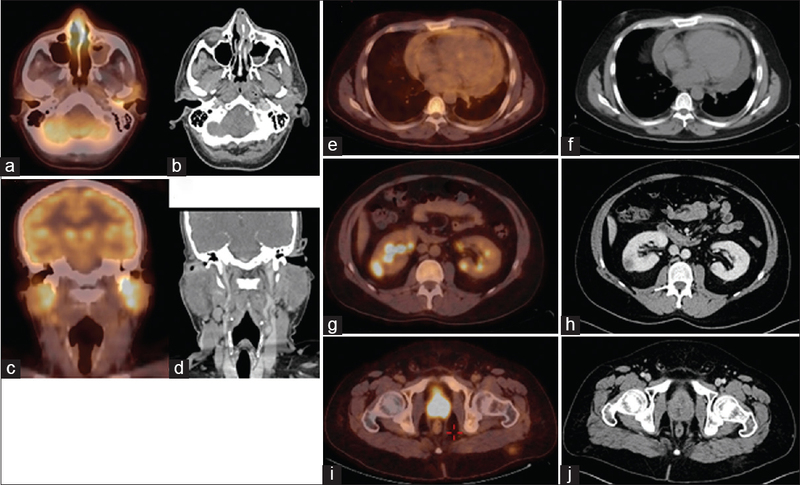 Almuhaideb A, Syed R, Iordanidou L, Saad Z, Bomanji J. Fluorine-18-fluorodeoxyglucose PET/CT rare finding of a unique multiorgan involvement of Wegener's granulomatosis. Br J Radiol 2011;84:e202-4. Stefan V, Michael K, Pieter V, Jan-Willem C, Marinus V. Clinical value of 18F-fluorodeoxyglucose PET-CT in patients with small- and medium-size vessel vasculitis, such as Wegener's granulomatosis. J Nucl Med 2012;53:353. Falk RJ, King TE Jr., Stone JH. Clinical Manifestations and Diagnosis of Granulomatosis with Polyangiitis (Wegener's) and Microscopic Polyangiitis. In: Post TW, editor. Waltham, MA: UpToDate; 2014. Available from: https://www.uptodate.com/contents/granulomatosis-with-polyangiitis-and-microscopic-polyangiitis-clinical-manifestations-and-diagnosis. [Last accessed on 2019 Jan 23]. Aberle DR, Gamsu G, Lynch D. Thoracic manifestations of Wegener granulomatosis: Diagnosis and course. Radiology 1990;174:703-9. Carrington CB, Liebow A. Limited forms of angiitis and granulomatosis of Wegener's type. Am J Med 1966;41:497-527. Stillwell TJ, DeRemee RA, McDonald TJ, Weiland LH, Engen DE. Prostatic involvement in Wegener's granulomatosis. J Urol 1987;138:1251-3. Martusewicz-Boros M, Baranska I, Wiatr E, Bestry I, Roszkowski-Sliz K. Asymptomatic appearance of splenic infarction in Wegener's granulomatosis. Pol J Radiol 2011;76:43-5. Nelson DR, Johnson GB, Cartin-Ceba R, Specks U. Characterization of F-18 fluorodeoxyglucose PET/CT in granulomatosis with polyangiitis. 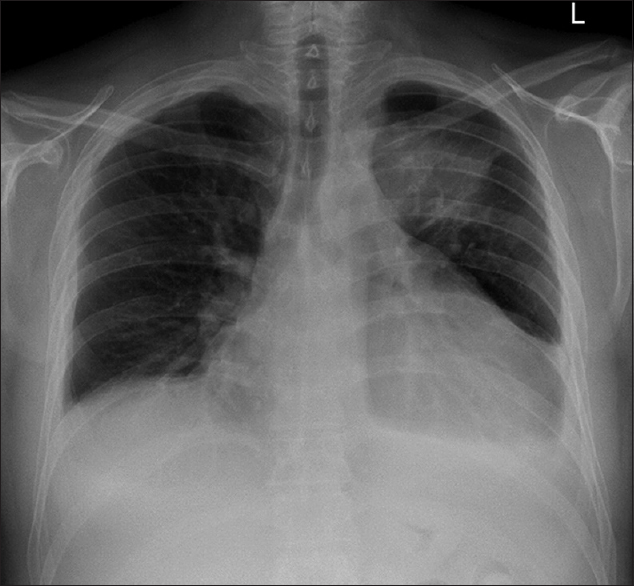 Sarcoidosis Vasc Diffuse Lung Dis 2016;32:342-52.